Once upon a time, wine storage for many was a cold, little metal cabinet with some cladding to make it look like it is a part of the interior. Loud compressors, terribly detailed LED strip installations and sweating glass panes were thought to be inevitable. Luckily, those days are over for people choosing to work with FWC. As clearly evident in this picture, the cellar is really an integral part of the interior. 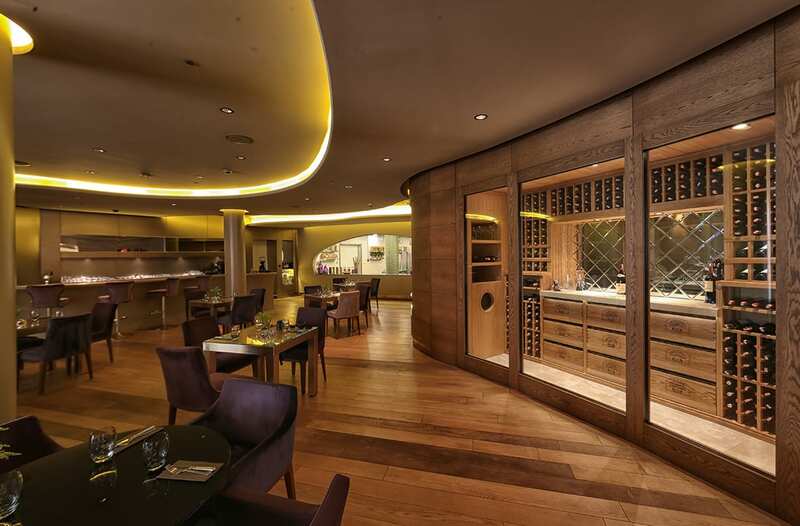 Following the smooth curved lines of the interior design, and matching natural materials, the cellar blends seamlessly into the space while simultaneously maintaining its primary function to present the wines in house gracefully. The solid wood display units and the feature mirror by the decanting counter add to the cosiness of the interior.